The latest incarnation of Heavy Gear is called Heavy Gear: Arena, but it's more of an optional side-game, than it is the next official version of Heavy Gear. As it stands Heavy Gear: Blitz is still the current most up to date ruleset for the full blown combined arms skirmish game of Heavy Gear. Arena is just another way to dive into the world of Heavy Gear, but on a smaller scale. Therefore Arena is a stand alone game all by itself, which utilizes some of the core rules introduced in Blitz, but everything you need to play Arena is provided in the Arena rulebook just the same. You can play Arena without Blitz, and Blitz without Arena independently. From what I understand in the past there's been Duelist Handbooks available for the earlier 1st and 2nd Editions of Heavy Gear, so as much as Arena might seem like a copycat of BattleTech's arena-style Solaris matches, it really isn't. The idea behind Arena has been around for years, and the Arena-like setting was depicted even in the Heavy Gear cartoon series in the early 2000s, they just didn't pull it altogether into game form like this until now. There's a couple of ways to jump into Arena. The first way is by picking up the rulebook in color printed softcover dead tree format for $45 USD, or via full color .PDF (for $20 USD), but there's also a nice Two-Player Starter Set which includes a small-format 5.5" x 8.5" B&W version of the Heavy Gear Arena Core Rules book, 4 Hired Guns Minis (Grizzly, Hunter XMG, Black Mamba, DartJager) plus extra weapons, 4x six sided dice and a Heavy Gear measuring tape, all for $65 USD. Dream Pod 9 is also running a few other bundled deals like the Two Player Starter set plus the full color softcover, or with the PDF version, and another with both the printed book and PDF. So there's a number of ways to get your hands on Arena at the moment. The best bet is probably the Two Player Starter set, which is what I'm reviewing here today. First up the rulebook that comes with the Two Player Starter Set for Heavy Gear Arena is rather small. On one hand I really appreciate the size, because being smaller like it is, it tends to fit most anywhere with ease, and all around makes for easier portability. On the other hand, after spending time with the book, I must admit, I really don't like the size of the text on most pages. The problem is that I think the format and style of Dream Pod 9 rulebooks tends to offer a lot of information on a single page, and they really make use of an entire page far more than most other companies do. This just doesn't convert over to the smaller format as well, because in doing so there's a lot of stuff that's simply really small on a page, and it makes for a tough read overall. I see what they were going for, but honestly the full size printed rulebook in B&W would have been a much better option for the starter set. Setting the size issue aside, the book does cover a lot of ground. 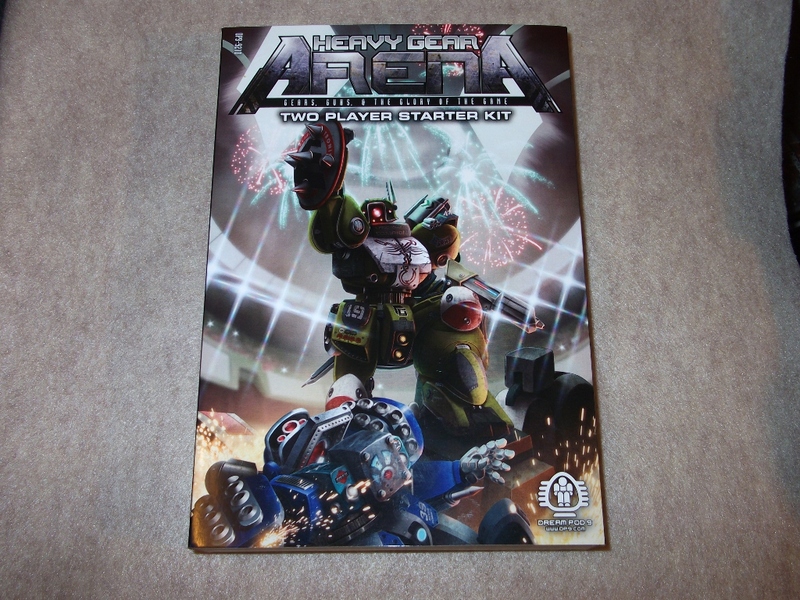 I was also sent the .pdf version of the rulebook as well, and as far as rulebooks go Arena is as nice as any of the other Heavy Gear books I've seen in the past. Heavy Gear Arena is another high production quality effort, which does a great job of not only entertaining the reader with lots of imagery, but is also an excellent tool to teach players the game via loads of very useful visual examples to boot. There's definitely no issue with the content of the book, it's just how you access it which will determine how useful it really is. At 112 pages there's a lot to take in too. My only other complaint would be that there's a bit of information overload going on too. It takes a read through a couple of times before it becomes clear how much you need to know just to get started with the very basic rules, versus what you need to know to engage in full blown Campaign games. It's clear that the game was designed with Campaign play in mind, because the full blown game of Arena pretty much revolves around having a Manager, Sponsors, Support personnel, earning Reputation as you go, and using the XP gained through Reputation and winning matches to further your team of Duelists through various upgrades and improvements. It's a pretty well thought out system, but the complexity has a pretty steep learning curve too, and even as knowledgeable as I am with tabletop games, I had to take a step back to figure out just how much of this I need for Quick Games and Tournament Play, and how much is optional and meant only for the larger scale Campaign style system. The problem is, there's no real Quick Start guide either. On the smaller Tournament/Quick Games scale you can simply agree upon some parameters, hire your Duelists and start fighting, but the more involved game requires a lot more micromanaging details like Managers, Sponsors and the limitations of each one, Support personnel and so on. These things add a lot more layers of complexity to the game overall. So there's essentially two games in one to be had here in Arena. As for the combat system, it's a lot like Heavy Gear: Blitz when it comes to the ranged weapons and movement, but it concentrates more on Combos, and Arena involves a lot more Melee stuff than Blitz. It seems to me that you end up with a lot more crazy combos and melee weapon possibilities in Arena than in Blitz. Gears wielding big axes and shields isn't uncommon in Arena. So on the melee end of things Arena seems a bit more brutal. There's also some really in-depth customization options for the Gears in Arena, and even the models mimic this, because there's so many extra little weapon bitz included, that I've had a really hard time deciding on just how to build the models included with this Two Player Starter Set for Heavy Gear: Arena. Options are always a good thing, but if I ever wish I had a bunch of micro rare-Earth magnets it's now. This is one game where learning how to build models with swappable weapons would really come in handy, because there's so many extra parts to work with, and it would be a real shame to just toss the extra weapons into a bitz box on not make use of them. What you have access in the game also has a lot to do with what Sponsors you're aligned with, what level you've decided on, and how you progress through the game. Again, it's quite dynamic in presentation, and if you like a lot of options, you'll definitely find that and more in Arena. The game is broken down into three phases for Quick Games and Tournament Games. The first phase is the Order phase to determine who goes in what order, next is the Action Phase and lastly is the Miscellaneous Events Phase, which pretty much ties up any loose ends from the two previous phases. Rinse and repeat until there's a victor. Digging deeper reveals pages worth of Team Managers to choose from, including how to improve them. Next there's about seven pages worth of Duelists and Duelist Talents to dive into. Support Personal can also be part of your Team, which includes Technicians, Engineers, Fixers, Handlers, even Promoters, Arena Clowns and Cheer-leading Teams. Techs for instance can repair damage, Fixers help obtain Gears, Equipment and Black Market items a little easier, and a Promoter ensures you go into a match with more Reputation Points than without one. So each have their own hiring cost and perks to having them around. Next up there's about nineteen pages worth of Sponsors & Gears, outlining all of the Sponsors in the game, and all of which Gears each Sponsor has access to. There's ten different Match Types in all provided, so there's a lot of ways to play Arena. 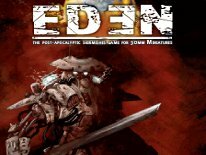 Match Types outlined in the rulebook include Shoot Out, Last One Standing, Stalker Prey, Block and Run, Lone Wolf, Close Sparing, Chain Duel, Team Skirmish, Pendulum and King of the Hill. The Arena itself is no walk in the park either. Barrels that explode, or that contain Oil Slicks or Smoke, various jump ramps and pits, even fire pits and rings of fire are modeled within the confines of an Arena. So there's a lot of really cool obstacles and cover to utilize. The Combos can also be performed on a single model level, or cooperatively in the game. They're all separated into combo types. For instance there's a page detailing all of the Standard Combos, then the next page details the Offensive Movement combos, after that is Offensive Fighting Combos. Others are called Pugilist Form and Kickboxer Form, which are Punching and Kicking Combos. There's also Sword, Staff and Form combos, and lastly Ranged Offensive and Ranged Defensive Combo pages too, and lastly a page detailing all of the Combos that can be executed Cooperatively, each of which are separated further by Level. Hired Guns are also the character Specialist/Duelists, and there's a few pages outlining them and all of their abilities. Some for instance are more specialized and are granted a bonus for utilizing a specific type of Gear. Maena Jarak has a Talent called Grizzly Mastery, granting her some bonuses to all Dueling and Defensive rolls as long as she's in a Grizzly Gear. Other Hired Guns have similar Gear specific bonuses as well. The rest of the book begins to introduce players to the Heavy Gear universe with a few pages worth of fluff detailing it all. There's also a few pages called Table and Terrain, which showcase photos of Arenas that Dream Pod 9 built for Heavy Gear: Arena to inspire players to create their own with. The book finishes up with a couple of pages of Weapon charts detailing all of the weapon stats, plus a really nice page full of pictures of the actual metal weapon parts, making for a really nice weapons recognition guide. The last couple of pages include a blank Manager Sheet and Duelist Sheet you can photo-copy and fill out, plus eight Duelist Sheets already filled out with the stats and abilities for the Hired Guns detailed a few pages earlier. If you've seen the models from Blitz then you have a good idea of what to expect from the Arena models. The Arena models are also all white metal, they come with 1-inch/25mm plastic slotted hex bases and are the same 1/144th scale/10-12mm scale as the Heavy Gear Blitz models. The images of all four models on the back and sides of the slipcase for the box are a little helpful when it comes time to build the models, but those images aren't much larger than the ones found on the blister packs themselves. So a little guidance in that department would be helpful, especially for first time players who are just jumping into Heavy Gear and model building. Eventually I was able to figure it all out, because I have experience with building models in general, but those new to tabletop gaming might be put off by the lack of a little more guidance. Granted you can tell which legs go with which hips, and which arms go on which models, but it's really tough to decipher which upper torsos are to be used with which models, and that's my biggest gripe in that department. As for the actual models, they really are quite amazing. The detail level even on the tiny little weapons is impressive, and I like the fact that with Arena you can wield some pretty nasty looking melee weapons like Axes, Shields and Swords. These are additionally all multiple part models, some of which like the Grizzly could benefit from pinning as well. The majority of the models I was able to build with just CA-glue alone, but a pinvice and some brass rod might be the route to take for the long-haul. The poses are all quite dramatic too. Each of the models look like they're in motion, and engaging in combat. They definitely look the part. The four models included are the Grizzly, Hunter HMG, Dartjager and Black Mamba. Essentially that's two small, a medium and one fairly large Gear model in all. Of all the models I think I like the Grizzly the most, but there really isn't a bad looking model among them. They're all impressive once built. Another nice thing about Arena is that it seems that more colorful paint schemes are encouraged. In Blitz it's all about sticking with your factions military colors, but in Arena it's more relaxed, and paint jobs can be more in tune with what you'd expect to find in our real world corporate sponsored professional racing circuits. So the sky is the limit when it comes time to paint the models. I tend to think of the Gears in Arena as the cars in NASCAR Racing with all the colorful smaller sponsor patches mixed in with the default corporate paint jobs. Actually there's a really nice Sponsors Decal sheet for $6 USD that you can pickup, to add more color to your Duelists, and to give them the look and feel of a true sponsored Duelist. There's also quite a few other new models available in the Arena range, with more to come. Separately you can purchase the Hired Guns Grizzly/Hunter blister pack for $30 USD, and the Black Mamba/Dartjager pack for $20 USD. There's also a Gladiator 2-pack available for $20 USD, a single Boa model available for $20 USD and a Duelist Weapons Upgrade Pack available for $20 USD, which will allow you to upgrade existing Blitz models into Duelists for Arena. I'm really tempted to build a colosseum for Arena now. Since gears by design are quite mobile Mechas (due to the wheels/skates and tracks built into their feet), building a setting for Arena is like building part colosseum and part skate-park. It shouldn't be too tough to create some ramps and barricades to erect an Arena-style environment for Heavy Gear Arena. Some of the photos in the back of the rulebook of sample arenas are quite inspiring too. However Arena isn't without its share of faults. Dream Pod 9 definitely needs a Quick Start guide for the rulebook to trim the fat and get players into the game and playing quicker, instead of having to wade through all of the stuff that needs micromanaged in the larger scale game, and having then to decipher what you need to get started, and what's optional. That's a must. The tiny smaller scale rulebook that comes with the Starter set is also really tough to read at times, more so when it's a page with loads of data on it, because unlike most publishers, Dream Pod 9 utilizes an entire page far better than most. On larger scale (standard rulebook size) pages this layout works great. On the plus side, I see some similarities to Avatars of War's Deathmatch game in the way of crowd pleasing, because in Arena you can also perform a few flashy moves to appease the spectators in hopes of pulling off a few extra Reputation points. I like that there are mechanics in place to give the game that Spartacus-like feel to it, while at the same time it also resembles in structure a sci-fi version of modern day corporate sponsored sporting events as well. Very cool stuff. Arena is also a nice way to jump into the world of Heavy Gear on a financially smaller scale, because games are limited to 6 Duelists per side, and usually its no more than 3 in the Arena per side at any given time, others are usually left in Reserves. Games can be played with as few as a single model per side too. So all that you need to get started is truly provided in the Two Player Starter Set for Arena. You could create a much larger Team too and hold some Duelists in Reserves, but the cost of admission to jump in and start playing Arena is a lot less than Blitz for sure. You can also use your existing Heavy Gear models as well, because they even provide conversion packs with weapons if needed. On average a pack with two Duelists will set you back $20-$30 max, some of the larger models are about $20 each too. Considering you really only need no more than 3x models for most Team scenarios, there's really no concern of sinking hundreds of dollars into the game just to get started. Therefore the “Buy In” is quite minimal in the overall scheme of things compared to Blitz, or BattleTech even. The models are just as amazing as those you can purchase for Blitz, and honestly I can't see why you couldn't use the Arena models in a Blitz army as well. Heavy Gear: Arena is a nice starting point to give Heavy Gear a try as well, because many of the core rules are the same, the only difference is that Arena utilizes a more in-depth melee system with Combos, which overall has more of a gladiator-style feel to it. All in all Heavy Gear: Arena isn't your daddy's Rockem Sockem Robots, instead it takes in-depth robot bashing skirmish-gaming combat action to the next level.